WIT strives to enable its customers to become data-driven decision making companies; aligning business intelligence initiatives with key business goals that advance customer satisfaction, competitiveness, productivity, and shareholder value. With over 20 years of experience and the successful completion of over 400 business analytics projects, our team of expert consultants have a deep collective experience that allows our clients to transform their data into actionable insights. 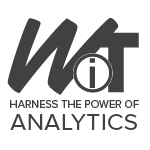 We are more than a just staffing service - we provide staffing augmentation to your analytics team. Our team is made up of talented people who are committed to WIT mission and providing excellent BI services to our clients.